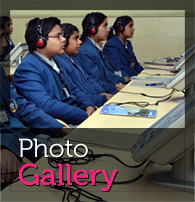 Huge emphasis is laid on technology intensive teaching. Audio visual aids like charts, models, video films, cassettes, filmstrips, overhead projector are used regularly. The child’s understanding is at a sensory perceptual level, thus the child best understands things which he/she can hear, see and feel. CTPS has tie arrangement with M/s Educomp Solutions Ltd. Classrooms are equipped with Interactive Digiboard System with a PC connected to a dedicated Smart Class Knowledge Centre inside the School Campus.A trained Programme Administrator is deployed by Educomp to ensure real time technical and technical training support for teachers. The teachers’ computers in all smart class rooms are connected to a dedicated server installed in the Knowledge Centre through a campus-wide network. A powerful smart class application engine allows teachers to view and map relevant digital content for their classroom sessions as per their time tables and syllabus. Teachers use the digital resources such as animations, video clips and simulated models as part of their 35-40 minute class room period to teach the specific topics in smart class rooms, enabling a multi-sensory learning experience for students. The learning becomes easier and permanent because of audio visual media. Practical demonstration of all the chapters through animation becomes effective to the student. Clarity & grasping of concept becomes easier. Scope for interactive method of teaching is more. Student’s psychological fear towards monotonous subjects like Maths & Science can be eliminated. Students are exposed to world class teaching method.